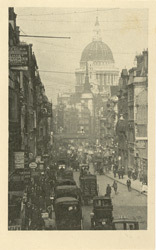 "There is no finer effect than St. Paul's from the foot of its hill in delicate and native weather; for the English climate (I may remark) is the finest in the world. I assume, of course, that the spectator is a serious mystic (that is, a materialist also) and appreciates the bodily beauty of heights, which should always be seen from below. The Devil takes us to the top of an exceeding high mountain, and makes us dizzy; but God lets us look at the mountain. Yet this mountain made by man can only be seen in London by 'sighting;' by getting it between two houses, as a pilot steers between two rocks. Get the sighting wrong and you will see only a public-house, or (what is much worse) a shop full of newspapers. Had either a French or a Prussian temple commanded such an eminence, the whole hill would have been swept bare as with a sabre and studded with statues and gardens, that it might be seen from afar. Only I should not like it so much. But then I was born in London."